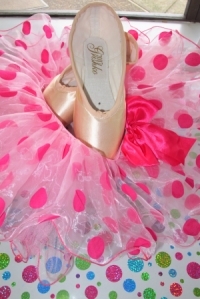 Dance Togs is well known throughout the United States for our professional fittings in ballet and point shoes. Freed of London - Known the world over as "The Principal Dancer's Shoe." All shoes made by hand, each with a maker's specific customizations. Capezio - Dedicated to providing techno-advanced pointe shoes. Noted for construction, design and attention to detail. Popular style is Aria, round shape throat, suede lining, #5 broad shank. Bloch of Australia - Noted for comfortable well constructed to please all demands. Styles in house are Aspiration, Jetstream, Amelie, Axiom, Synergy, and Balance, with wide platform for balanced weights, which reduces pressure on metatarsals. Griskko 2007 - Most popular model and premier Russian made pointe shoe. This model fits a remarkable variety of feet with a beautiful, sleek appearance. Lightweight, supportive, and comfortable in standard, medium, hard shanko. Capezio - Noted for over 100 years of dedication to the dancer's shoes in both leather and canvas. Juliet is the latest style in soft durable canvas. Bloch - Traditional ballet shoes for class, performance, and exams in both leather and canvas in all widths. New design is the Zenith, an ultimate stretch canvas with streamline fit. Grishko Model 6 - Model 6 features a flat forefoot sole and cushioned heel. An innovative piece of elastic is sewn into a special unlined central panel for an outstanding conformity to the arch. We carry top line shoes so please feel free to contact us for a personal fitting at 503-644-7545.